Eliminate pest problems effectively and permanently with this aggressive ultrasonic/flashing light animal repeller. Get rid of Cats, Dogs, Squirrels, Deer, Bears, Birds (Pigeons, Woodpeckers, Seagulls, etc. ), Skunks, Bats, Rats, Foxes, Raccoons, Mice and much more. 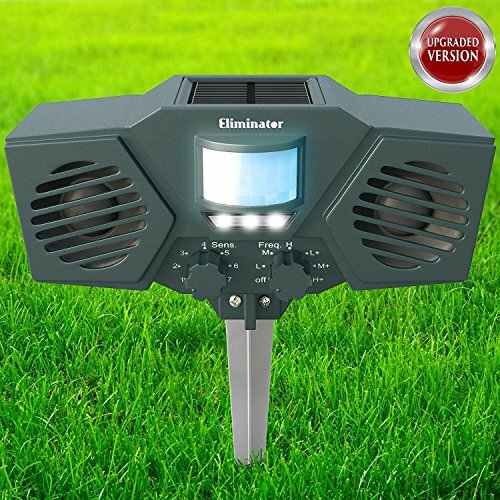 The Eliminator Animal Repeller blasts a range of powerful ultrasonic sounds and flashing LED strobe lights to scare away a wide variety of pests. Equipped with an infrared motion sensor, the pest repeller is activated as soon as a pest animal is detected. Simply take it out of the box, stick it into the ground with the included metal stake, and select your desired settings (features 3 ultrasonic frequency settings, an optional on/off LED light, and 7 sensitivity settings). No wiring and no batteries to replace or recharge; features a solar panel on top of the device that harnesses the sun's energy and recharges the batteries (3 AA rechargeable batteries included). / Can also be recharged via USB (A USB charging cable is included). No messy chemicals or pesticides, no traps, no dead animals. The PestZilla Solar Powered Ultrasonic Animal Repeller gets rid of all animals through emitting a mixture of ultrasonic sounds and powerful flashing LED strobe lights, frightening the intruding animals and pests to leave the area. Equipped with an infrared motion sensor; the pest repeller activates when it senses motion. Motion sensor ensures it runs only when needed. No traps, no dead animals, no messy chemicals or pesticides. Get rid of Cats, Dogs, Deer, Bears, Squirrels, Rabbits, Skunks, Bats, Rats, Foxes, Raccoons, Mice, Birds (Pigeons, Woodpeckers, Seagulls, etc.) and much more. The Eliminator pest repeller is extremely powerful and will expel even the most aggressive animals from your property. Features a solar panel on top of the device that recharges the batteries (3 AA rechargeable batteries included). Simply take it out of the box, stick it into the ground with the included metal stake, and select your desired settings (features 3 ultrasonic frequency settings, an optional on/off LED light, and 7 sensitivity settings). Can also be recharged via USB (A USB charging cable is included). Weatherproof and waterproof. Perfect for yards, patios, porches, boats, gardens, farms, etc. / PIR Motion sensor: Detects motion from up to 30 Ft. / Size: 6" x 3.5" x 2"
Permanently eliminate pest problems with this powerful ultrasonic/flashing light animal repeller. Get rid of Cats, Dogs, Deer, Birds (Pigeons, Woodpeckers, Seagulls, etc. ), Bears, Squirrels, Rabbits, Skunks, Bats, Rats, Foxes, Raccoons, Mice and much more. The Eliminator pest repeller is extremely powerful and will expel even the most aggressive animals from your property. / Upgraded for top performance.